I don’t have a whole lot to say about Re:coded, but I wrote an entry like this for 358/2 Days and intend to do it when I get around to 2.8 and Back Cover, so it makes sense to put a little something together. But Coded was always the least consequential of the Kingdom Hearts games. You could understand the overall story without 358/2 Days, but it filled in a lot of backstory for Roxas and Axel in particular – which is vital for trying to get us to accept Lea in KH3. Coded on the other hand could be left out altogether. Like all the minor KH games, this was a handheld spin-off. Not just a handheld console game, but a phone game. It was later ported to the DS and pushed that hardware fairly well. It was also fun because you could make it very difficult if you wanted to. Story-wise, however, it was a bit of a dull chick. The story revolves around the Disney characters discovering that the journal Jiminy Cricket kept has been wiped. Apparently a semi-digital creation, they use a data version of Sora to recompile the fragments of data and eliminate bugs that have somehow been included. Pete and Maleficent get involved and it all gets more convoluted, and the ending actually supplies a little more depth and clarity to Naminé’s character and decisions, but so far at least, this game’s events haven’t had any significant repercussions. The Re:coded release added a little bridging scene between Birth By Sleep and Dream Drop Distance, which is quite fun, but doesn’t give any information other than making it clear that what will happen in KH3 is a result of defeating the other forms of Xehanort. This HD remaster doesn’t have any new visuals, either, though it is quite nice to see the story presented in a nicer way. 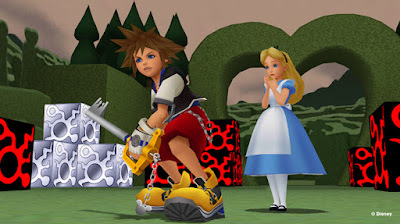 The cast come in to record the lines, too, Haley Joel Osment now well-practised in his slightly weird high-pitched Sora voice, which still sounds very odd coming out of the KH1 model, but that definitely makes for a more entertaining ‘movie’. Final Mix 1.5 had a fun game, a lacklustre game and a fairly interesting movie. 2.5 has two fantastic games and a rather throwaway movie. But I have to say of the two, the latter is a far better package.